It’s without doubt, surely that Jimmy LaFave is seen as one of the founding fathers of what we know as Americana Music and in my humble opinion; one of the finest songwriters ever to come out of America. The Night Tribe is, remarkably his 17th album since he first released Down Under in 1979; yet he’s nowhere near losing his spark, as he delivers 11 exquisitely crafted self-penned songs and re-interprets two Americana masterpieces; barely making them recognisable as they become Jimmy LaFave songs. Regardless of the name on the album cover; the beautiful artwork immediately caught my eye and track #1; The Beauty of You held me spellbound the first time I heard it. After not playing his music for a long time; I’d forgotten what a wonderful voice he has; and his way with words is close to being second to none. The first cover to get the LaFave ‘treatment’ is Neil Young’s Journey Through the Past, which he breaks down and slows down before adding some heartbreaking slide guitar, piano and organ making it the best song the Band never recorded. While scholars could write whole thesis on some of the songs here; I will cherry-pick a couple; Talk to an Angel is achingly beautiful as it combines a wonderful lyric with an orchestration Randy Newman would be proud of. The title track is dark and moody; full of shadows and innuendo; while Never Came Back to Memphis (which follows) ups the tempo as LaFave’s voice comes close to cracking as he delivers a couple of lines. While his interpretation of Journey Through the Past impressed me and surprised me in equal measure; it’s a very brave man who takes on a Dylan song these days; primarily as they’ve become so passé, but again; he takes Queen Jane Approximately and turns it inside out; upside down and gives it a brand new lick of paint making it totally extraordinary (again). While Jimmy LaFave no longer needs comparison with other artists; I hear the Band’s influence all over this album; especially Radoslav Lorkovic’s piano/organ playing which is straight from the Garth Hudson School of Excellence; and his tinkling of the ivories turns a very good album into a great one. 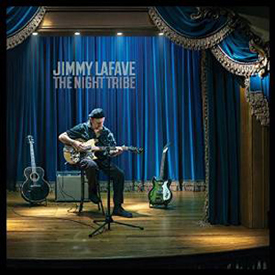 2015 is already turning out to be a wonderful year for new and fresh music; and I can assure you that Jimmy LaFave’s The Night Tribe is one of the finest and is essential listening.